There’s no doubt the Ford Ranger has been a huge success. In July this year over 6400 were sold between here in Mzansi , Europe, Middle East, the rest of Africa and plenty more around the world. Part of the Ranger’s success is based on its tough looks as well as its real and perceived strength and ability as a load hauler, tow tug and off-roader. And along with this bakkie’s success comes a burgeoning aftermarket, as owners personalise their Rangers for that unique look. 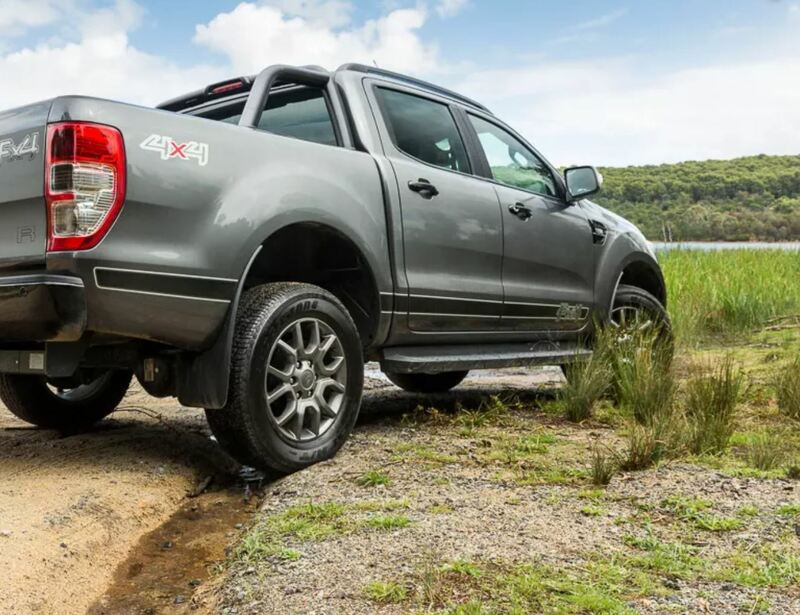 The marketers at Ford haven’t missed this and have started launching limited-edition variants with that customised look, enter the Ford Ranger FX4. The FX4 special edition builds on the XLT with a black optics pack, some 18-inch ‘Stark Grey’ alloys, black roof rails and leather accented seats, monogrammed with the FX4 badge. It’s hard to argue with the aesthetic. The FX4 looks squat and purposeful; the Magnetic Grey paint of our test car even delivering a degree of subtlety for a car that looks to have had most of Ford’s options list plastered to it. Given that the smallest price difference between mechanically-identical trims of the Ford Everest is about R20 000. THAT the Ford Ranger is a better bakkie than the Toyota Hilux is a fact that takes some time to get used to. How do you go about beating the unbreakable legend? It turns out that doing the basics right like offering decent ride quality, a gutsy engine, strong value and keen utility are enough. It’s like Buster Douglas beating Mike Tyson by the simple expedient of stepping to the side to negate his bull-like power. Sometimes the most obvious solutions are hidden in plain sight. 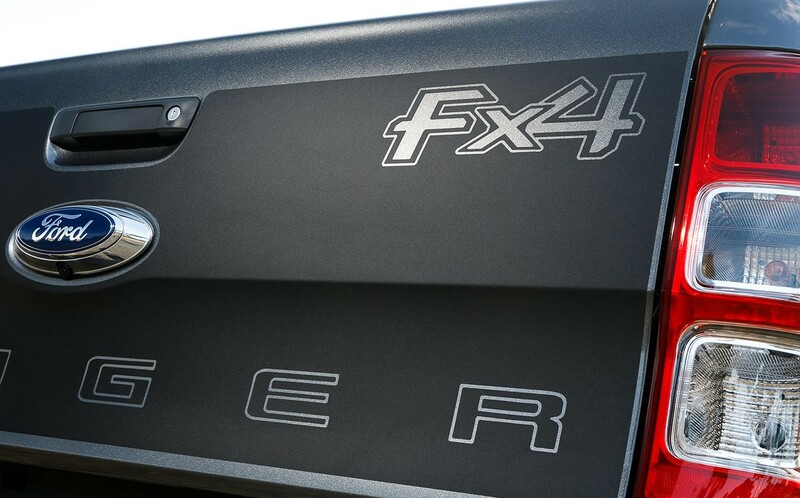 The FX4 gets all the goodies from the XLT plus a whole bunch of black stuff including black bonnet and tailgate decal wraps, black roof rails, black roll bar, black rear bumper, side steps and door handles. There’s also a blacked-out grille, black exterior mirrors as well as 18-inch grey alloy wheels with a unique design and side decals with ‘FX4’ branding. The black theme continues on the interior with black leather-trimmed seats, front and rear floor mats and black highlights on the dash. We love the Ford Ranger. Sure it’s expensive, but it offers buyers a real, hard-working vehicle with a grunty diesel that puts out 470Nm of torque and has a 3500kg towing ceiling. It’s a comfortable cruiser on the highway whether loaded or empty, which is a lot to say for a one-tonne bakkie (the XLT’s payload is 995kg). It’s also pretty frugal, and although we couldn’t get near the claimed fuel economy of 8.7L/100km, we did achieve a figure under 10.1L/100km which is pretty good for a big bakkie with big outputs. And the Ranger is loaded with technology. Gone are the days when a ute was just another tool of the tradie. 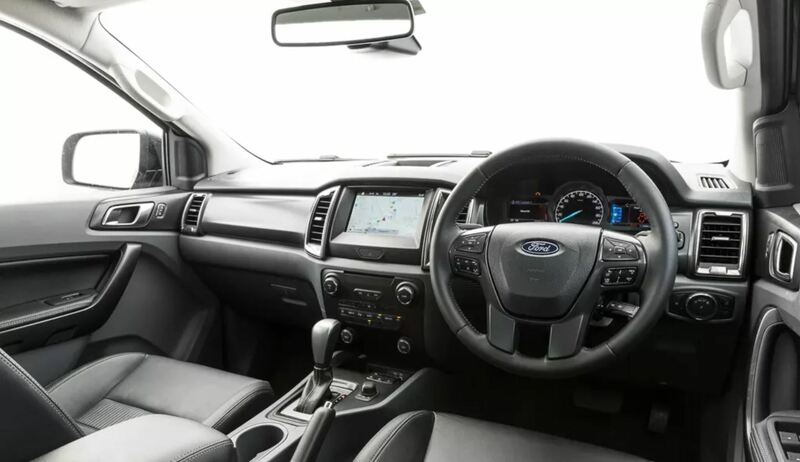 The Ranger offers Ford’s SYNC 3 with voice-controlled sat-nav, which includes DAB radio, 8-inch colour touch screen, iPod and smartphone integration, reversing camera and front sensors. There are also rain-sensing wipers and a tyre pressure monitoring system, while an optional Tech Pack features forward collision alert, lane keeping assist, automatic high beam control and adaptive cruise control. All up, it’s a modern and sophisticated vehicle that just happens to be in the guise of a bakkie. If you’re after a 4WD dual-cab ute, the Ranger is hard to go past. The 3.2-litre five-cylinder turbo-diesel engine combined with the six-speed auto gearbox is a real winner, and one of the best combinations on the market, arguably only bettered by the Volkswagen Amarok V6. No matter what spec, the Ranger will haul loads, tow your boat or caravan, get you through the roughest tracks and yet do it all in comfort and with a bit of style. And if you want to stand out from the increasingly crowded Ranger car park, this could be the right jigger for you. It’s available in four exterior colours: Frozen White, Ingot Silver, Magnetic and, of course, black.